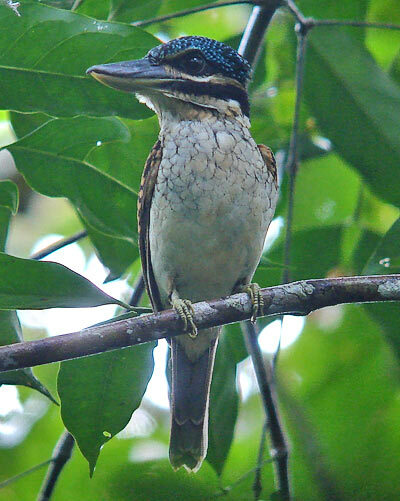 Call: Hook-billed Kingfishers call and sing mainly at night. The commonest call is a plaintive liquid whistle followed by 1–4 (usually 2–3) short notes at higher pitch: ‘teuw-tu-tu’ or ‘tooo-too-too’. Sometimes there are 2–3 initial plaintive whistles; and the final short note may be trilled. The call lasts about 1 second, and resembles a short, loud Common Paradise Kingfisher song. A second call or song is an irregular series of 3–5 plaintive notes, downslurred and then upslurred, lasting 2–5 seconds (Coates 1985). 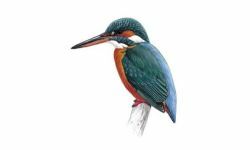 The alarm is a repeated chatter, like a paradise kingfisher.